I live on a small horse farm in the north of Bavaria. A westernstyle riding school with nice horses, two dogs and a cat at our place. A riding hall makes good weather all the year round. Our tiny village is surrounded by beautiful nature, many forests and hills. Next little town is within 4 km distance, bigger cities in about 50 km. Tourists and people from around visit us to learn how to ride horses and to understand them in their natural way of acting, also doing groundwork with them all based on natural horsemanship. I'd like to host a DIY handyman/woman who likes horses and helping in and around the stable. An at least 3 weeks stay gives us the chance to have a good experience. Which means that in return you take part in our family life and learn about horses as much as you want. 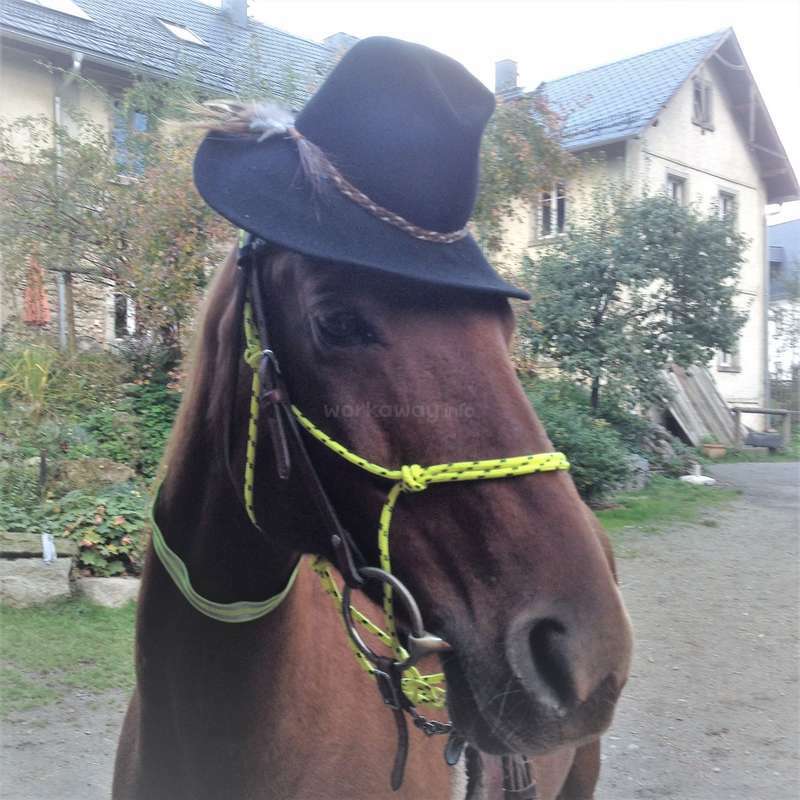 I am looking for some real horsewoman/man helping out when I am on holiday for three weeks. Best from May to beginning of June (four horses and a dog to be cared for). It's a big farmhouse, so many other horsepeople and my family are here, you wouldn't be totaly on your own. So possibly seeing you soon!? Always have a save travel! There is help needed around the horses, like mucking stables, repairing fences or some work around my house. A double room with bathroom and shower. My Girlfriend and I stayed with Uschi under unconventional circumstances in that we brought with us our own two horses and our own car. This arrangement allowed a lot of flexibility for both ourselves and for Uschi to come and go always taking turns managing the homestead and never having to worry about the welfare of our animals. Uschi was very… read more nice to talk to and to work with daily. Her home was always tidy and comfortable. Her food was good. Some of her family members live within the complex and were very kind to us. I found Uschi's boyfriend, Kurt, to be especially charming. We even dragged him to a concert one night and had a great time. Besides the daily barn duties, some other projects came up and we happily helped out including picking apples or helping out with Uschi's riding students, and I am very proud of the electric fence I completely overhauled one day. Overall, it was a very nice WorkAway experience and I can confidently recommend it to others. The only regret I have is that outside matters made it impossible for us to stay longer than we did. My first volunteering via Workaway. The best experience I could have. I am grateful to have met Uschi, she is a great teacher for me. The city is small and very beautiful, there are larger cities around. The house is large and warm. It is surrounded by wonderful forests that deserve to be walked for hours. WORTH IT! I spent a month and a half… read more living with Uschi and the truth was that it was all magical. From the moment one felt like family, everyone opened their arms and it was very beautiful. I am very happy to have shared so many moments, trips, talks, meals, horse riding, walks, games, parties, everything was beautiful. Life is simple, you do not have to run, everything happens in its moment and it's perfect. Living as natural as possible is my style, and it is better when you find people and can share, so if you think the same, do not hesitate to enrich your life with the company of Uschi. The work in the barn maybe a bit heavy for some, for me it was not, I love it. The horses are wonderful, to know them, to connect with them, to feel part of the herd ... The truth is that I miss them a lot. And yes, I must talk about someone in particular. 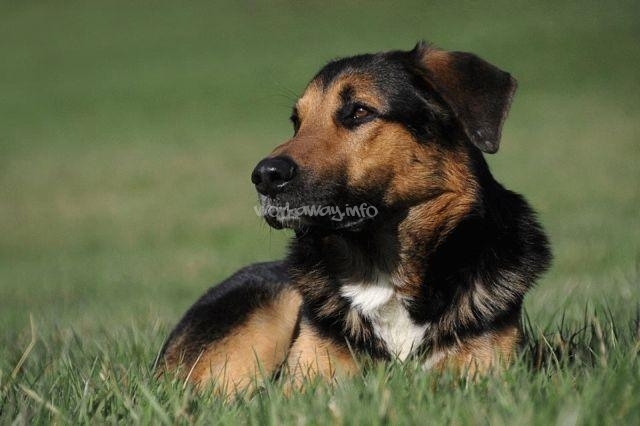 The faithful companion of the house ... FYNN, beautiful, friendly, brave, sensitive, crazy, daring ... The best hiking companion. I love that dog, I swear. All the people I have met during my stay with Uschi left a mark on my heart, really, I am very happy. Thanks Uschi for trusting me, for opening your heart, you are a wonderful person! I love you! Adam stayed with us for about two months doing all the work around my horses. He is very good with animals and so I was very glad to have such a great helper who I could rely on perfectly when I wasn`t able to care for the horses myself. So invite the sunshine when he is calling at you! Thanks for everything, Uschi, it was a blast and I'll miss you! After moving into my new flat she helped me sorting out or at least to find a place for all my more or less useful belongings. She is very responsible in helping and sees the things to be done. She is also wonderful with horses and the work around. And - we… read more had a lot of fun with baking and cooking , testing new recipes. All the best for your further traveling, Camilla and a very big hug! Abde is a great workawayer, smashing himself into work, looking for things to do even without being told. He likes horses so much and did all the jobs around them very well, and also easy going and responsible person, and nice guy to have and fits so quickly in your team. I had such a great time in the ranch, I would really recomend it. The atmosphere was very good, and here the star was Uschi. She will do anything on his hand to make you feel like at home. She is an incredibly good person and a great rider, you will get great riding lesons! The work was very fair, and the accomodation and the… read more food also very good. It is really worth to visit the ranch and stay for a while. I wisch you all a great stay. Cheers! Dear hosts, if you are looking for a responsible, hard working, ever so nice and helpful workawayer, Jose will be the perfect person to meet this attributes. We had a short but very good time at our ranch. He has a good way to handle horses and to organise himself with the work around them. Wish you a happy time together. And the best for… read more Jose's future travelling. 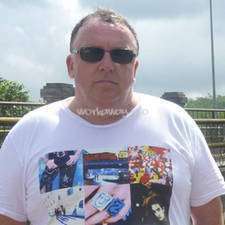 Jack is a wonderful worker and friend; someone you can rely on, with a happy and willing attitude. He's always doing more than is expected of him and is easy to get along with. Over the Christmas period he really helped the ranch keep going and did so with a smile on his face! With a caring heart he can be trusted to take good care of animals,… read more cook and be there for the whole team. Ursula. Thank you for your very warm and kind hospitality during my one month stay at the farm. the work was never too hard, the food (thanks to Roland) was great, and the (long) free time was filled with fun activities - horse riding lessons, hiking, shared dinners... . I hope I could come back in the future. your care and attention deserve the… read more best volunteers. Pau cancelled his long arranged stay one day befor his arrival date and therefor I had to ask him twice by mail as time came near. I told at least five other would-have-been-glad-to-come-workawayers off. There is nobody now. Thank you Paul. Clara is just great. Absolutly reliable, helping where it's needed and knowing what to do befor you say it. Great company and easy going. I'd take her back in a heart beat. All the best for you future travels!!!! We miss you all, and all the beautiful horses.. and of course Fynn :) hope his feet are better. Thanks a lot to Hayley and Sam for staying with us. Working hard and very skillfull, being reliable and most nice in helping - so I only can recommend the two with the best wishes for their future travelling. We had a lot of fun and miss them already. Samuel is a most reliable, helpful and hard working young man and we had a lot of fun during preparing my moving to another farm. Marlotte is most reliable, helpful and cheerful. It was great to spend such an adventures and exciting time together. All our workawayers are marvellous in their ways. Thanks a lot Rebecca - see you ! I was lucky enough to spend a wonderful two weeks (and my first 'Workaway' experience) with Uschi and all of the lovely people who live and work at the ranch. Everybody was so kind and generous; I felt very much 'at home' at the ranch and enjoyed all of the work immensely. I learned so much about the Bavarian way of life, and we even took a… read more visit to a traditional Bier-festival in Drachselsreid! A LOT of fun! Working with the horses was amazing- we did a lot of mucking out, put up a fence, weeded the paddocks, put up a section of the new stables, and much much more- all of which was very rewarding and enjoyable. 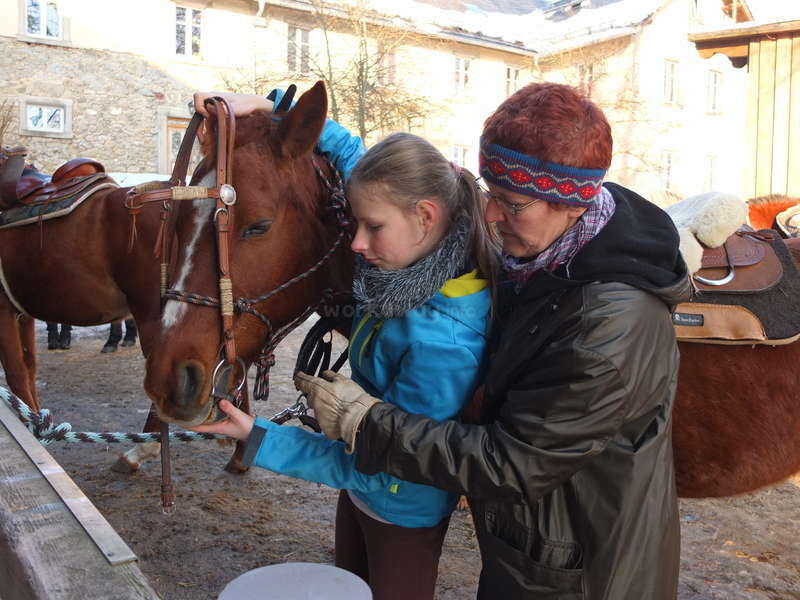 Uschi is very talented at her work with the horses, and it is inspiring to watch her lessons and learn from her- I could not have imagined a more perfect Workaway experience. We had numerous trips to the vets with a poorly dog, kitten and horse, but happily all of the animals felt better quickly! The scenery in and around Prackenbach is breathtaking, and driving through the Bavarian forests with Uschi and Fynn (the dog) is something I will never forget. We were lucky enough to visit a glass factory, explore Kötzting, and visit a fair, as well as the evening out in Drachselsreid, where we made some new friends!! I feel so lucky to have explored this beautiful part of Germany, and I would dearly love to return here someday. I had a fantastic time with Uschi, and of course Karin, Roland and everybody else at the ranch! I was only sad that my stay could not be longer (I had to return to my job the UK). Thank you so so much for an unforgettable Workaway experience. I really do hope our paths cross again soon. I stayed with Uschi and Reinhart last May and had a great time. Benson and I (another volunteer) helped build the round pen. It was really good to be able to start something and see it finished. All the best Uschi on your adventure at your new stables!!! Charles und ich hatten flexible sechs bis acht Wochen geplant - drei Monate sind es geworden. Er hat selbständig unsere Pferde versorgt, uns über die schneereichen Wintermonate hinweggeholfen und mir meinen Computer gesundgepflegt, als er sich einen Schnupfen einfing. Absolut zuverlässig, selbständig arbeitend, mitdenkend und immer einfühlsam zu unseren Tieren, freuen wir uns schon heute, wenn er wieder mal "vorbei-jettet". Ein weiterer gern gesehener Gast in unserer mittlerweilen großen "Workaway-Familie). Alles Gute für die "Weiter-Reise"
Die Uschi war mein erster Workawayaufenthalt, und meine Entscheidung nach Schönlind zu kommen, war eine der besten, die ich je getroffen könnte. Die Arbeit hat fast immer darin bestanden, sich um die Pferde zu kümmern, also die Pferde auf die Koppel zu nehmen, die Ställe auszumisten und wieder einzustreuen, und morgens und abends die Pferde zu… read more füttern. Die Arbeit passt gut zu mir, weil ich Handarbeit der Kopfarbeit vorziehe, und arbeite auch lieber allein. Es gab auch bestimmte zusätzliche Vorteile, die unter anderem Deutschübung (die Uschi hat sich viel in Geduld eingeübt) und Reitunterricht beinhaltet, die bei der Uschi eingeschlossen wurden. Die Vorteile haben die Höhe meines Beitrags bei weitem übergewogen, meiner Meinung nach. Diego was with us two times and helped us with the horses, the stable, the holes for our round pen (which was very hard work), in the house refurbishing, carrying heavy furniture - and additionally coping marvellously patient with all these "women" and their ideas of redecorating rooms!!! Thanks a lot for coming, hopefully see you again soon! Ni hao!!!!! hahaha. This was my first workaway experience. I only stay for a week but I want to return In September all the month. Uschi and Reinhard are special. I was very good at their house. I only had one problem with they.... My English hahaha... I lost a great conversation with Uschi because I don´t speak english very good. If you like… read more horses, the work isn´t a problem. The landscape are great!!! The food are great too. Fynn (the dog) and Lucie (the cat) are amazing. Thank you for making my stay that great!!!!! In September I repeated in this fantastic farm. I was 4 weeks. Initially I coincided with Josemiek, Laura, Carolin and Leo. The first week I was doing holes for the posts of the new riding school with Leo and Reinhard in the mornings. We celebrate Laura's birthday there and Leo surprised with clouds American type. His son Leo is fantastic also, is an artist and always he is smiling. Later I was doing the horsework and helping Reinhard with the concrete. The work was not hard. I spent it to myself brilliantly, initially it was going to run with Laura in the evenings, Josemiek gave me some lessons with Nico, I learned some phrases in German as: wurdest du mir die butter given bitte?!!;). Josemiek, Uschi and Reinhard had more patience with my English. I enjoyed the pastry and the fantastic food. I practised with Uschi the most difficult knot of the headstall, walk with Fynn and I enjoyed the barbecue that we did with Nadine, his family and the neighbors. Also I spent it to myself very well doing photos of funny faces. At the end of my stay Uschi helped me to be able to go by train to Munich, there I was in a friend´s house for 3 days and knew the Oktober Fest. Before coming back home Josemiek and me went with Uschi and Reinhard to had dinner in Bavaria's typical restaurant and I could enjoy the typical food and the fantastic beer of the zone. Really I was charmed with the experience and the farewell was very sad with Uschi on the station, but I am very happy to have known them and to be able to support the relation with Uschi and friends by facebook. I recommend earnestly this farm ..... it´s fantastic!!!! Uschi and Reinhard were wonderful hosts, very kind, good natured and just downright lovely people really. Only one bad thing I have to say about my stay there: not long enough :D. (only because it was decided too cold to start on the plannned carpentry project which I was looking forward to). But still, it was a pleasure to cook windbeutel (? )… read more for everyone. I also enjoyed clearing out and meeting her horses. Obviously she cares for them very much and it shows from their temprament, that she treats them with compassion, respect and kindness. Thanks to Laura we were able to clear out our attic and did a good deal of reorganizing the house. She was great with our animals and took the mucking part as her daily workout. She was working hard, with initiative and always in good mood. Hope to see you again and always drop in if you happen to be near! All the best for your further… read more travelling! Casey and Tory are the best workawayers you can imagine. Very friendly, helpful, indipendently working and reliable in all the jobs dealing with the horses and the house. They took over all responsibilities while I was away for a week - again thanks a lot for all your help!!! And of course we had a lot of fun with these great girls - but: never be… read more on a diet when they come - you wont be able to resist their delicious cooking and baking talents!!! We had the most wonderful time with Uschi, Reinhard and ALL the animals.. it's a real struggle to put it into words. The setting of their beautiful place is great- this tiny little village surrounded by forrest and farmland. Although some may consider it isolated, it is really wonderful to get away from it all (and there are towns nearby!). We… read more really felt that we were taken in and treated as part of the family- it was so sad to leave. Some of our favourite memories include drinking mulled wine around the bonfire with neighbours and friends. The work is not hard, as long as you aren't afraid of a bit of poo, and then most of the afternoon was free for walks with Fynn (world's best dog! ), working with the horses or whatever you choose. Uschi is a fantastic teacher and so willing to share her knowledge. 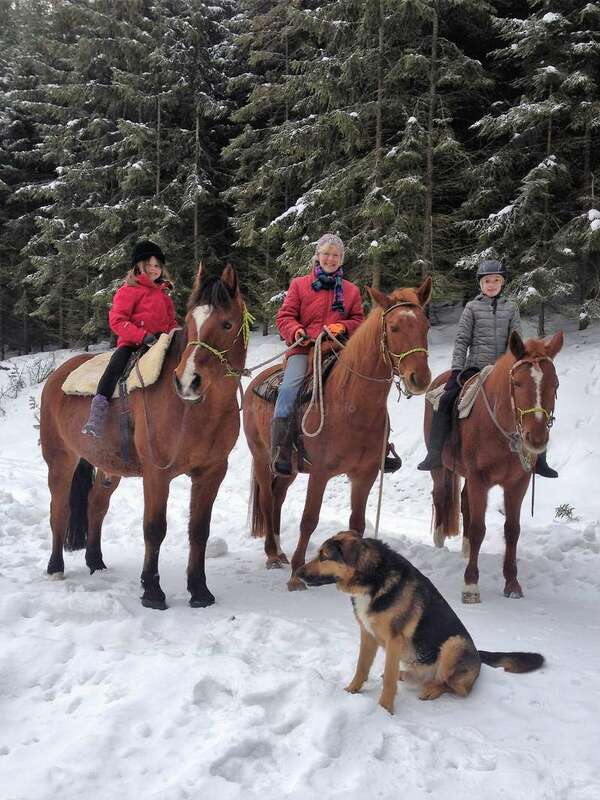 We would highly recommend going to stay with Uschi and Reinhard if you are after an authentic German workaway experience, with wonderful people and horses! well..sorry uschi but as far as I remember I did not confirm dates with you..what I remember is you contacting me in the first place to help you with your projects if I remember well, and discuss with you the possibility of coming to you at some stage in april..unfortunatly something happend in that month that kept me unable to move from where I… read more was and away from internet use....I have been in quiet different places since I started my workaway experience in december 2012 and I always make a phone arrangement with the hosts to confirm..and we didn´t. If you feel let down well I am sorry but some time is just not possible to recive or contact people when you are on the road..I have been let down couple of times my self by hosts after travelling quiet a journey and find my self in unconfrtble situations..so what can I say to you..
and we came a month in August 2011.
so we had a lot of fun and a great time with many laughter. We lived like a big family together and we still have a very good contact. We highly recommend Uschi and Reinhard`s place!!!! Dieter and Doris were with us and the time changed. Everything went on to be a bit smoother, quicker, much more funny and a lot healthier by cooking fresh food and avoiding to eat murdered animals. Dieter analyses work to be done and organises the quickest way to manage. He helped everywhere he saw it was needed. Doris brought sunshine in… read more everywhere she appeared and helped me sort out my old stuff and took heartely part in mugging the stables. Many, many thanks to both of you, for staying here and telling us your wonderful stories from all over the world. May there many of them be added. All the very best wishes from all the people of our farm. He was a great help the few days he was with us. We are sorry that only due to an unfortunate accident of his wife at home he had to leave us so soon. To have Paul around your place, so you are lucky to have somebody hard working, knowing what he's doing and always open to learn new things. We had great fun, great musik and I hope he will drop in again to our place. When you are a bit sick of the Irish rain - then just have a change, have the cold weather of Schönlind! I spent nearly 3 weeks with Uschi and Rinehard and had a great experience. If your into horses then look no further. Uschi is kind, thoughtful and is a great host providing comfortable accommodation and lovely food. Christopher just shmashed himself in the new business of doing everything around horses and with his "wanting-to-know-why" attituide about everything, his questions also made us think about our dayily routine again. Which turned out to be quite useful. We had a great time - and when we hear of him next, he will be called "Sir"something and the… read more food on his plate will have certainly changed a lot! Gilbert is just the man you want to wellcome at your place. Full of energy, good ideas, a very good feeling for animals. Everything he starts and does, is well thought of and very well done. Thanks a lot for being with us Gilbert - looking forward to your next visit!!! if Roman happens to knock at your workway-door, be glad and open it. He is the most reliable, hard working, kindly helping young guy you could get. Thinking about everything to make better progress and eager to learn or better soak in what's offered on new interesting things. Took me a long time to write this little feedback, hope I… read more got it right. We would be always very glad to be able to welcome him at any time he comes near our farm. "All the best to your further traveling, Roman"
We spent a wonderful month with Uschi and Reinhard. They were kind enough to let us stay with them over Christmas which for us meant a lot being a long way from home. We also had the fortune of having a fantastic meal prepared by their Chef son Sebastian! Uschi and Reinhard are very warm, friendly welcoming people who made us feel very much at… read more home. We were there over some cold weather (for us anyway!) and it was always great to look forward to some of Uschi's fantastic cooking after a day's work. We will miss our time there and can thoroughly recommend it to any workawayers. We were not 'horse people' before we went but Uschi was a very kind and patient teacher of all things horsey. Thanks again for letting us into your home and we'll be in touch!! Cathrine and David were here. Not only that they did a marvellous job on doing the daily work with the horses, cleaning their mess... There is the car shed that has finally the wall it waited for a long time and they looked for old boards to renew and Cathrine did so well in painting and decorating. Not to forget Davids planned horse shed on which… read more we will have a start in spring - the most noble and efficient you can think of - I can prounce about, when they are famous architects :-). We had a great time and I wish them all the best. So to Sophie. You hosts know it's difficult to find words for all the wonderful young people visiting us, to describe their helpfullness and different great talents we experience on their visits. 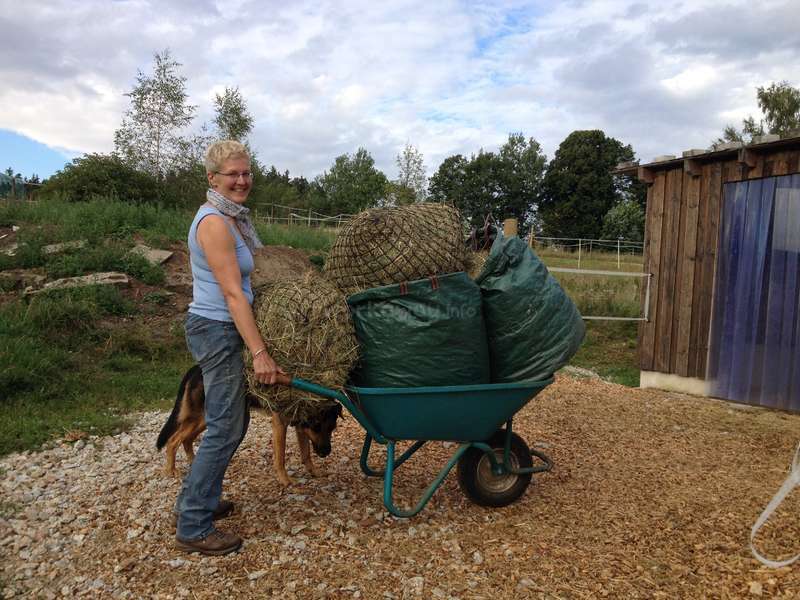 The same with Sophie, she is a pro round about horses and even found out about her talent in helping to build a wooden wall for the car shed or… read more refurbishing. Thanks a lot for staying with us and we wish you all the best for your future travelling! I had a fantastic time with Uschi and Reinhard. They and their sons were so welcoming and made their little farm feel like a home away from home for me. I miss all the horses, and of course the two (lap)dogs! Uschi was always helpful with the work--mostly cleaning out the stables--and always making sure that we had enough entertainment, either… read more riding or taking a day trip to a nearby city. And there was always more than enough food! I'd love to go back if my travels take me to Germany again! Josh and Jemma thank you so much for coming and staying at our farm. As everybody can read their feedback about us, on which it is so well set, what happened at our place. So I will stopp writing soon. Only to tell every other host that he gets the most reliable, like to be busy, cooperative, nice and easygoing people he can think of. Who… read more wouldn't moan about anything, they were just very, very helpful. It was a great pleasure to us to have them in our big family! All the best wishes for your further travelling! Staying at Uschi & Reinhard's place was one of the most amazing things to have ever happened to the both of us. From the moment we arrived to the one we left, we created and shared so many memories with the "Kunz!?" family that I think we've both solidified ourselves a home away from home. 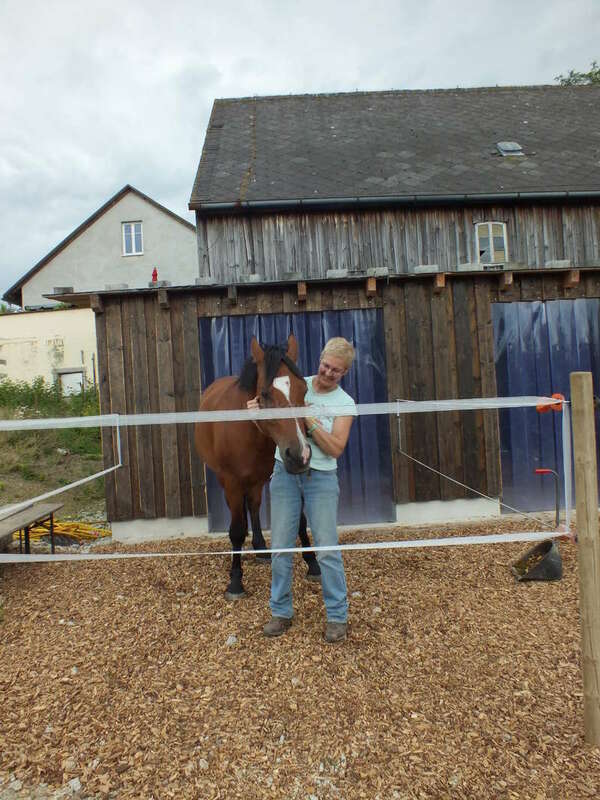 Our work at the farm and around the home, though there… read more were neccessary jobs to do every day, was never boring and - with the help of fellow workawayers Adam & Steph - we even learnt how enjoyable it can be to clean stables with a good team and some hearty German music. :) During our time we re-wired the fences for three paddocks, pulled one down completely, dusted, cleaned and repaired various parts of the barn, picked LOTS of apples and made - only 200L - of apfelsaft, weeded and planted Spring's bulbs in the garden (and toyed with the idea of writing secret messages to Uschi!) as well as lots of raking leaves, mowing, weaving vines and some general tidying-up of the yard. During Uschi's busy time in the October holidays, I also helped her in taking lessons with the kids - a unique opportunity that I was lucky to have. It wasn't all work though - occasionally we got a day or two off completely to visit a nearby town, or hang out with Leo and his band in Halle, who were a really easy-to-get-along-with group of energetic and passionate people who lived for their music - we had a great night with those guys. Otherwise there was always a free afternoon for a trip to the beautiful and mystical Felsenlabyrinth, or - generally our favourite privilege of all - a ride through the simply stunning countryside on one of Uschi's beautiful horses. I can't quite describe in my inadequate English words just how much I am in awe of Uschi's knowledge for her animals and how impressed I am by her training methods, the horses truely were a pleasure and a gift to be able to work with every day. I can't thank you both enough for the warm hospitality and the unforgettable time we had there - undoubtedly we will see you and all your beautiful animals again sometime in the not too distant future. Dear hosts, if it happens that Stephanie and Adam Chin are knocking at your "Mail-Door" and it goes along with your timetable, then just be glad, give them a few hugs when they are coming and a special one from us. They smashed themselves into the work at our farm, got the clue of everything, did it well and in very good "toime". We had a lot of… read more fun and they also liked very much to deal with the horses, loved our dogs and actually there is the "Adam-roll-over"- move the dogs show off nicely now for a bit of treat. So everybody can just be happy to have this nice couple around. We wish them the very best for their future life travelling. They always have a additional home at our place! Steph and I have just finished our first experience as helpers on Uschi and Reinhard's horse farm in Germany. They are the most wonderful people you will meet and they welcome you into the family from the start. If your lucky you’ll get to meet their two son’s Sebastian and Leonhard. Sebastian’s cooking is not to be missed, he is a chef and… read more Leonhard’s personality and musician talent will ensure you are never bored. We started off with the plan of staying 2 weeks and ended up being there for a month. What an experience, we couldn't have jammed packed more work and fun into our first help x experience if we tried. They have 12 beautiful horses on their farm, 7 which they own and 5 others who their owners stable them at Uschi and Reinhard’s farm. Their two dogs Katie and Butch are awesome, Katie is super smart and very cute, while Butch is the biggest 2yr old puppy your ever going to meet, don’t let his size scare you, he is so much fun to play with and is all puppy at heart. Lilly is a very timid barn cat but she enjoys a gentle pat, while Lucy the house cat will be crawling all over you looking for affection in no time. Along with the two Indian walking ducks that is the whole gang. During our stay we woke up at 7:30am every morning and tended to the horses, after breakfast "Broadside" we would then muck out (clean out) the horse stables; all 12 horses. A hearty hot lunch followed and then we attended to fixing the necessaries around the farm; in our short time we managed to mow and clean up around the yard, dust out and dust proof an entire section of stables, mend a sliding stable door, refix a barn door cover, pull down and refurbish 3 electrical paddock fences and pick about every piece of fruit their fruit trees held. After 2 weeks we were joined by another Australia couple, Josh and Jemma and the work and fun continued. But it wasn't all work, during our time Uschi and Reinhard arranged for us to stay at their son Sebastian's apartment in Munich and we got to attend Oktoberfest, their other son Leonhard took us to the Felsen Labyrinth (stone forest labyrinth; really cool). We got to go to a local lady's bee hive and tried fresh honey as well as fresh milk from the village cow farmer. Uschi took us to Nurenburg and we ventured around the local castle and streets. We got to participate in the plate smashing ceremony before Uschi goddaughter's wedding. We savoured the flavours of our hard work with freshly made plum cakes and fresh squeezed apple juice. Uschi’s cooking will ensure that you are never hungry and generally laying around afterwards feeling cheerfully plump. We enjoyed several bon fires on cold nights, drinking wine, beers and listening to Josh (fellow aussie) strum out some good tunes on his guitar. Best of all Uschi showed us how to ride horses western style and the rides through the forest on horse back were absolutely magical. We would really love to return to Uschi and Reinhard’s farm and if time permits, its number 1 on our list! Josemiek stayed only a week but it seemed so much longer. She was very good in helping and working on her own all around the horses. She also was very patient in introducing me to my computer ;-). We loved to ride, to talk, to laugh, to cook, to eat - we had a good time. I can recommend her best to all future hosts and hope that she will visit us… read more again at our place. Josemiek visited us last year only for a week. We managed to do a lot of things, but it was too short. This year she was staying 10 weeks. There was the routine work around the horses to be done and she had a very good way of handling them. But on top of that we had a hard go onto sorting out long neglected rooms of our house - with marvellous success :-). Josemiek is a talent in organizing and redecorating rooms. She is a wonderful cook. And it was not only working with her, but having a lot of fun and a very good time. And also thanks to her experience and knowledge in so many different ways, which she freely shared with us. So I can recommend her in best of all ways to every host. I had a great time during my stay, and I wish I could have stayed longer. Uschi is very flexibel and generous. And I have met nothing but nice people in and around the stables. This was an exchange of knowledge too, that was very interesting an well appreciated. Not to forget the laughs we had and the good food. What else can I say. Thank you… read more Uschi and I hope to meet again. I went back after my initial stay for 1 week last year. This time I stayed for 10, and when the time came to leave there was only one reason why I was able to: Autumn is coming, and with that it is getting colder. But I need more smileys here because 4 is simply not enough. There is no way to discribe everything we did, but it was all done with big fun. And a lot of food. We had so many cakes here, I was lucky to be working so hard. If that hadn't been the case, I would have had to buy new pants. I said working, but to me it never felt that way at all. I am just lucky to have somebody to lend me her horses to play with. I got to put my theory into practice, and I learned some more. A lot more I would have to say. She has some wonderfull horses, and some wonderfull forests to ride them in. I cannot say for sure that I will be back, but I sure want to. Some day. As this was my first workaway experience I had absolutely no idea what I should expect, but from my arrival at the farm until my departure yesterday I had a great time there. 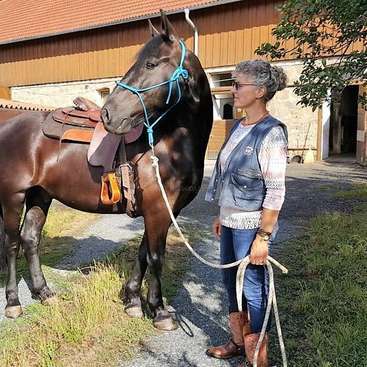 Uschi is a really special and open-hearted person and her way of handling horses is - in my eyes - simply great. The work you have to do is hard but you'll get used to it… read more soon, also the pretty nice people who are around the stable all day long will help and answer every question. The family is uncomplicated and very nice, including the two amazing dogs and the cat ;-). Thank you for making my stay that great, I‘m sure I‘ll come back soon! Anne left today and we already miss her. She is a very nice, uncomplicated girl that fits in at once. Her time at our horse farm wasn't easy because of my imobility due to an accident. She worked very hard, was loved by my riding guests and fullfilled her tasks in a very responsible way. Dear hosts, I can recommend her to you without any… read more doubt. Thanks a lot Anne! The best wishes from all 2- and 4-legged creatures at our place!